Wando is such a scenic place located in the southern-east area of Korea. The whole Wando area is acknowledged as a Dadohaehaesang National Park, a marine national park with many islands. The sea of Wando is known for its cleanness, and produces great quality of seaweed which production amount in whole Korea goes up to 80%. Although the Wando Sea is quiet, there is a strong tide current from the combination of shallow water depth and many rocks. The more tide gets strong, the more abalone stick on rocks. 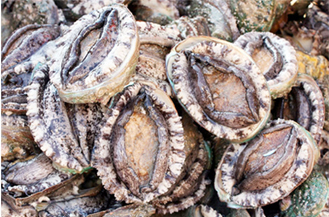 This helps abalone to be firmer, larger, and tastier, in high quality.The quality of Wando Abalones is highly-evaluated around the world today, and exports are growing year by year. 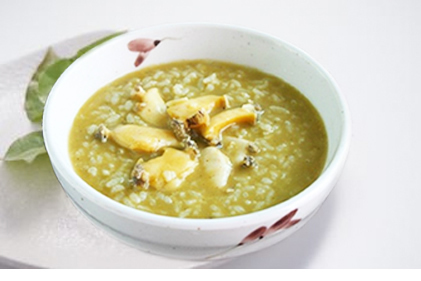 Rice gruel with abalone is well eaten for recovering from fatigue and nutritional supplementation. This is easy to digest, and good for breakfast. 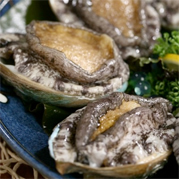 By adding sesame oil, the great taste of Abalone can be enjoyed more. In Korea, this is one of the representative dishes for recovering from sick. 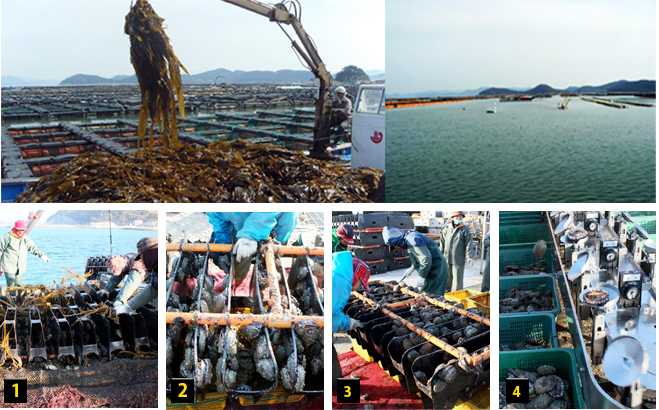 To catch abalone, carry the shelter from cage to ship directly, and take abalones off from shelter on the ship. On the rough waves, as you can see in a picture, take the whole shelter out to work on. 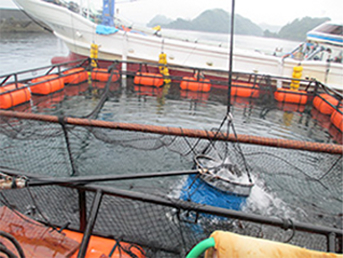 On a calm sea, haul up near the cage, and catch abalones. they stay under the shelter in daytime, and show up on shelter at night for eating. Nets prevent from being sucked by their sucking discs, and abalones cannot go out even in night time. This is on taking out of abalones. ucking discs of abalones are very strong, and we cannot take them off by hand. To take them off, we use unsharpened longish knife. The price of abalones differs from the weight. To divide them into by weights, put abalones on the dish of divider, and they spin to drop abalones into baskets according to its weight. Baskets are in 12 ranks. Even when we put young shellfish together, in same day and same time, those sizes become different. 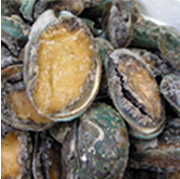 We deliver strictly selected Ezo abalone from Wando alive. They are cooked puffy and deliciously with our original seasoning of the pride. 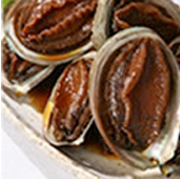 Our abalone is very popular as is useful for cooking in any kind of dishes. Copyright ⓒ 2019 True World Japan Inc. All Rights Reserved.